To support further decentralisation and resilience of the Stellar network, SatoshiPay starts operating the network’s first globally distributed cluster of full validator nodes — maintaining a database of all past ledger operations, with publicly accessible history archives and the fastest available API for querying the ledger. One of Stellar’s core strengths is its underlying Stellar Consensus Protocol, allowing decentralisation without requiring ever more resources — as proof-of-work-based networks do. Every five seconds a new ledger state is agreed upon by validator nodes. Operators can freely decide which other nodes they trust for agreeing on the new ledger state. At SatoshiPay we know how crucial it is to have a diverse set of reliable validators on the network and therefore we already operated professionally maintained validator nodes in Germany for more than a year. Our previous nodes were “light nodes”, maintaining only the latest state of the ledger for validation — as most current nodes on the Stellar network do. We have now upgraded to “full nodes” with a complete archive, and each node consuming more than 700 GB of storage. 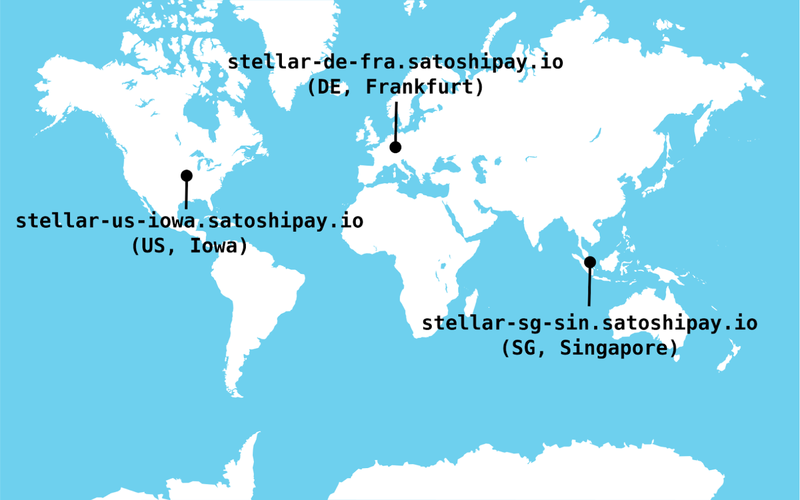 We are thrilled to announce that a few days ago we completed our upgrade by launching a completely redesigned cluster of full Stellar validators that are distributed across the globe: Iowa (US), Frankfurt (Germany) and Singapore (see documentation for details). The new setup immediately increases the resilience against local issues like power outages or network slowdowns — not only for SatoshiPay but for the entire Stellar network. Another highlight of our new setup is that each node now stores the entire history of the Stellar network. The resulting history archives are publicly accessible for everyone (see docs) and help other validator nodes to catch up with the network after creation or maintenance. Up to now most validators relied on the history archives offered by the Stellar Development Foundation (SDF) and we believe the three new SatoshiPay history archives are an important step towards further decentralisation. There are now 10 history archive nodes available: 3x SatoshiPay, 3x SDF, 2x Coinqvest and 2x Lobstr. We strongly encourage other node operators to make use of the additional archives and also to publish a history archive. As a Stellar user you can relax and benefit from the faster API and the more resilient network that is powering SatoshiPay and other Stellar-based applications. If you want to start operating a validator node, check out the SatoshiPay Docker images that power our new setup (via Kubernetes): satoshipay/stellar-core and satoshipay/stellar-horizon. We also developed a new script that runs a parallelised full-history catch-up for Stellar Core in less than a day — instead of over a month with a normal catch-up. As a validator node operator we encourage you to modify your Stellar Core configuration to use our new validators in your quorum sets. Also add the new history archives for catching up, see the validators documentation. Get in touch with us at stellar@satoshipay.io to get verified for inclusion in the SatoshiPay quorum sets.